Rabbit is located mid way down on perennial Sloaney Poney hotspot – the King’s Road. With a close proximity to the Curzon cinema, this makes an ideal date plan. Can’t go wrong with a good film and quality food – well not in my books at least. Rabbit has a certain ‘country goes modern’ feel to it. 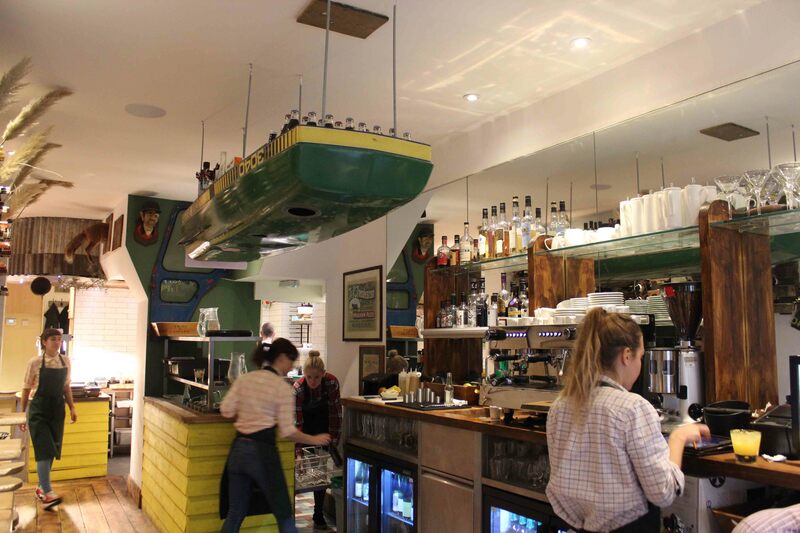 It seems they’ve made an effort to stamp out any notion of fusty country cliches; yes the core and foundation of Rabbit is undeniably British countryside but everything about Rabbit is contemporary, from their British small plates to the venue’s look and feel. We sat in the bar area which really wasn’t a bar area but more like a row of tables of two with suspended bar stools – I actually really liked this – super intimate (again why this place is great for dates – cue subliminal message for any fine young men wanting to ask me out 😉 but the table (irregularly carved) would have benefited from being that slight bit bigger and a coat hook would have totally sealed the deal for me. On the other side of the room is the main dining room, made up of a number of small and larger tables with benches, chairs and stools for seating. 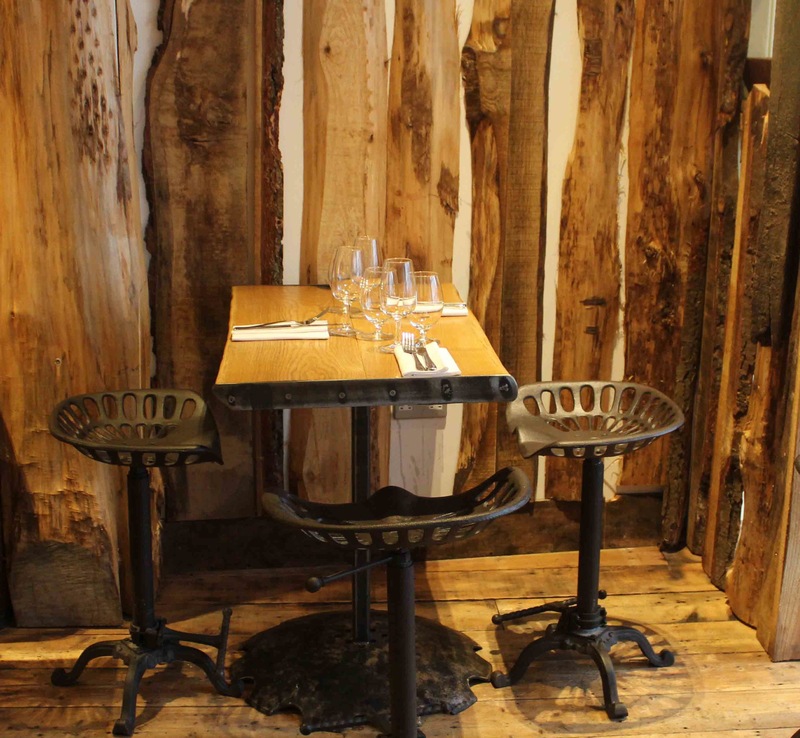 I have to admit I would be nay happy if I went for a meal here and got lumped with the stool option – they look far from comfortable. At the back of this area stands the kitchen where the chefs are visible to the diners as they plate up the dishes. There are a few ‘quirks’ to add to the country feel. 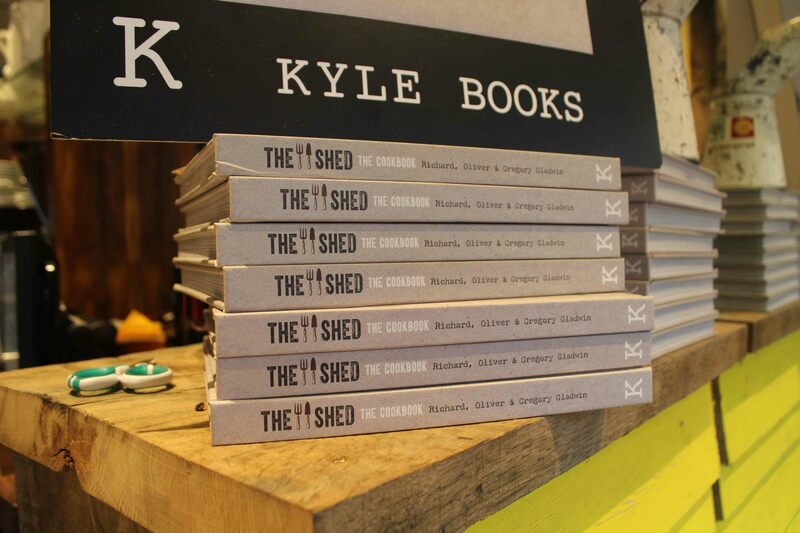 3 brothers (one a farmer, another a chef and the last a hospitality professional) pulled their talents together to create The Shed two years ago and now Rabbit. 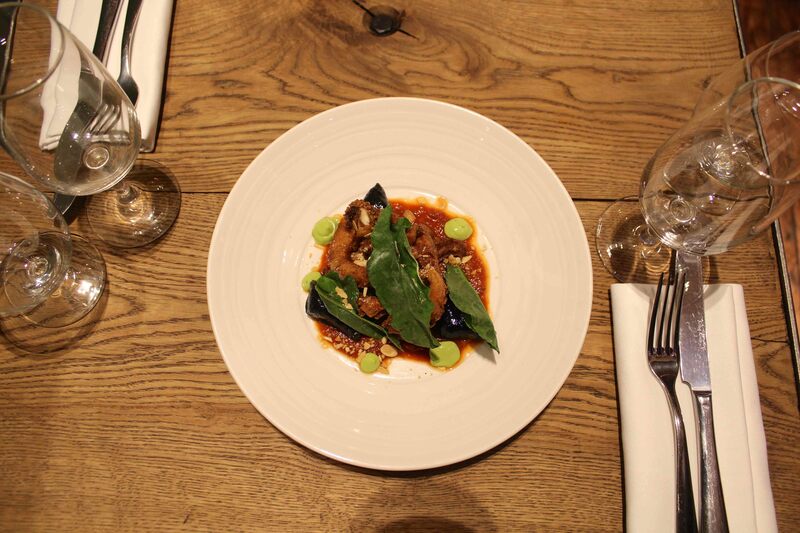 Much of the produce comes from their farm in Nutbourne, so they are able to offer their diners ‘fresh farmed and foraged seasonal food’. To get us going, we started off with some ‘mouthfuls’ and they are exactly as advertised (not a sharing plate in short). Had the brown crab bomb (lemon and dulse): this was pretty good, nice and crispy on the inside, warm and fluffy on the inside. I would have loved this had it had a little less of the herbed cream that sat atop and beneath it. Also had the woodcock pate, smoked potato with quince: a delightful little mouthful. Part of the menu is made of sections: slow cooking and fast cooking and this is mainly in reference to pre preparation time, as was explained to me. From the fast cooking section, much seemed very appetising indeed, namely the black cuttlefish gnocchi. However, we only opted for one dish in the end, from this chapter of the menu: the rabbit ravioli, bone marrow, yellow chanterelles and lovage pesto (£9.50). 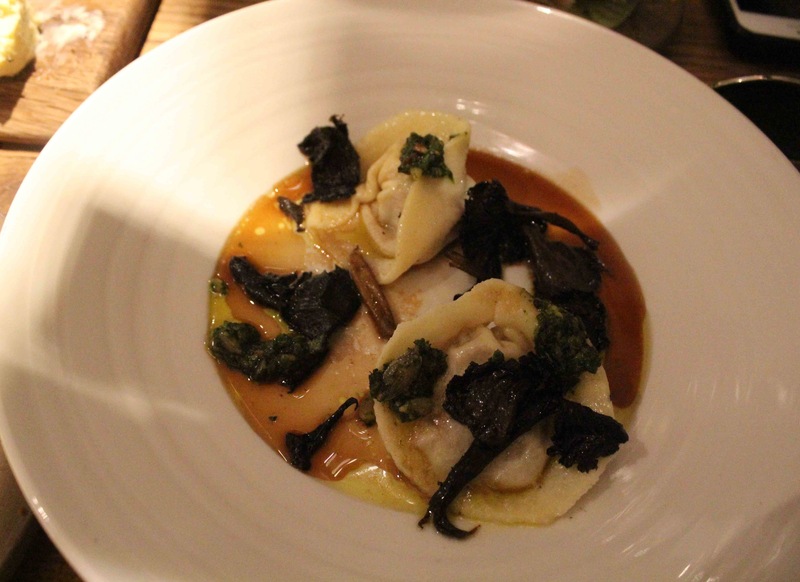 The consistency of the ravioli was good, not too thick and the rabbit inside the little pasta pouch was lovely and tender; I’m a big fan of fungi and loved its presence on the menu here; the lovage pesto was also sublime. The components came together beautifully, making this a very pleasing dish. We mopped up the juices with a bread roll and found this to be a theme throughout the course of the meal; such was the deliciousness of the sauces, they warranted a complete wipe down. 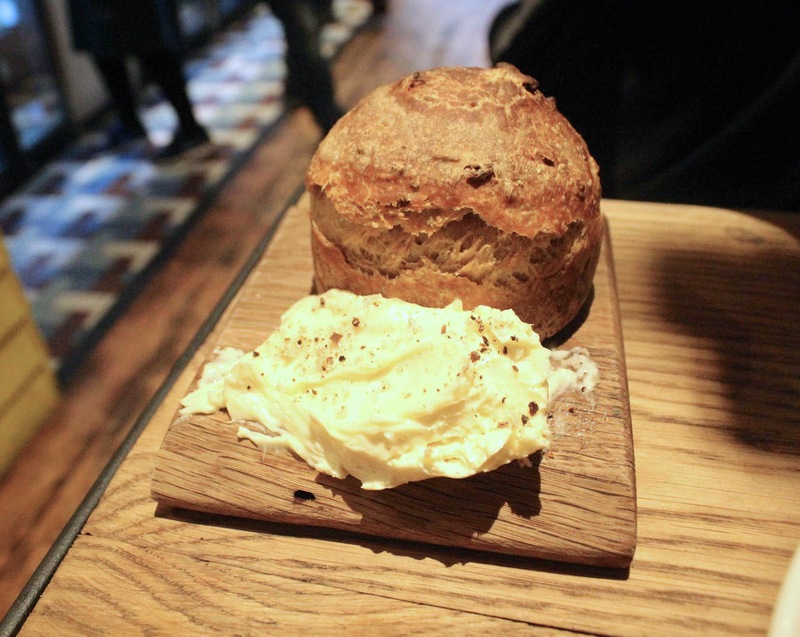 On the topic of the bread, we had the wild yeast bread that came with a huge serving of shallot butter (£3.50). The serving of the shallot butter is ridiculously disproportionate to the size of the breadroll though you won’t catch me complaining. As much as I love a rich salty butter, it was quite nice to have something altogether pared back and the shallot addition was a welcome one. 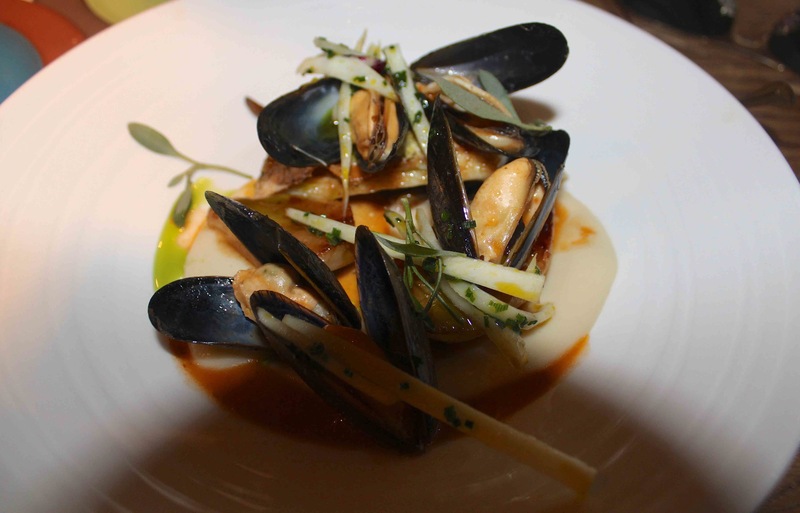 We had two dishes from the Fast Cooking section: first up was the red gurnard with mussels on a bed of creamy mash (£13.50) . Yes yes yes. There was nothing to pick apart on this damsel of a dish. Fish was well seasoned with a slight crisp to the skin and was in perfect unison with the mussels, imbued with the most delightful sauce, which I just couldn’t get enough of. 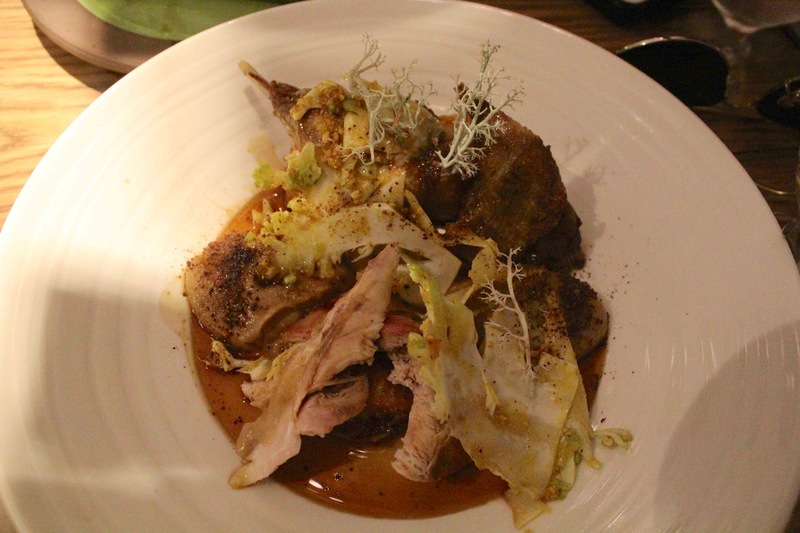 The partridge dish (£11) rounded off our foray in the savoury part of the menu and what a high note to end on. I don’t see partridge too often on a menu, so whenever I do I jump at it. I love the depth of flavour to this game bird. In this instance it came as a deconstructed bird to aid consumption. I gravitated towards the darker parts of the meat which bear the most flavour, though the breast meat did really hold its own, in this instance. The hazelnut that punched boldly through the leg of the partridge was just the right amount of nuttiness and was a very welcome flavour in ma bouche. Having tasted each part of the dish as a solo act (all mightily pleasing), I went in for the ensemble forkful: breast and leg of partridge with a stroke of duck fat layered on a delicious slice of crisp potato, with a bit of crunchy romanesco, got me squealing with excitement (internally obviously). As I mentioned, the sauces were too good to waste, so another order of bread was due. My dining companion decided to offer up a piece of advice, saying complimentary bread should be on offer for this very purpose (at £3.50 per roll – it can add up). The Brit inside me recoiled a bit in horror and laughed trying to make the situation seem less confrontational but I need not have worried as the man tending to us vehemently agreed. He said they had done slices of baguette during the week but didn’t have any today. So, he offered us a comp roll which was a very nice gesture. Although I was really quite full at this point and actually rather shockingly my appetite for sweet things has reduced of late (well to that of an average sweet toothed individual), I had to give their puddings a go (all priced at £6). 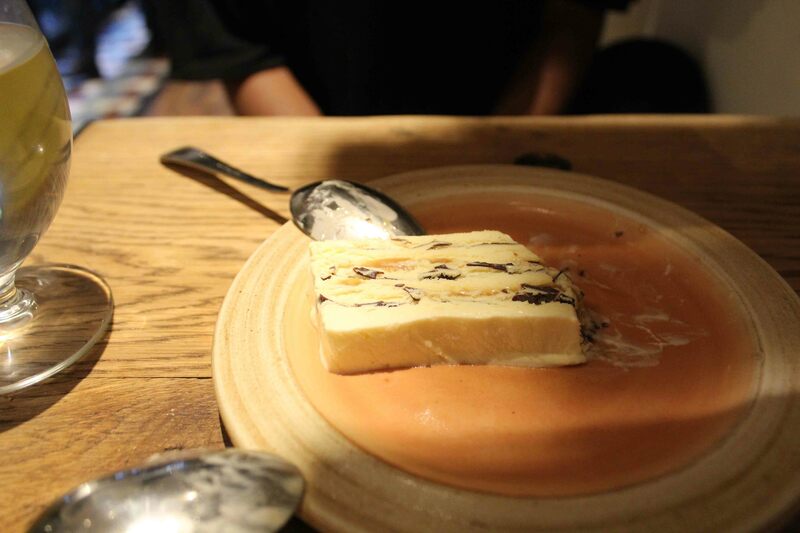 I tried the Shed Magnum Vienneta parfait which is basically a mega posh version of a normal Vienetta. The caramel although really quite sweet isn’t sickeningly so. It was a nice dessert that would satisfy most palates and which our waiter referred to quite appropriately as their ‘banker’ dessert. 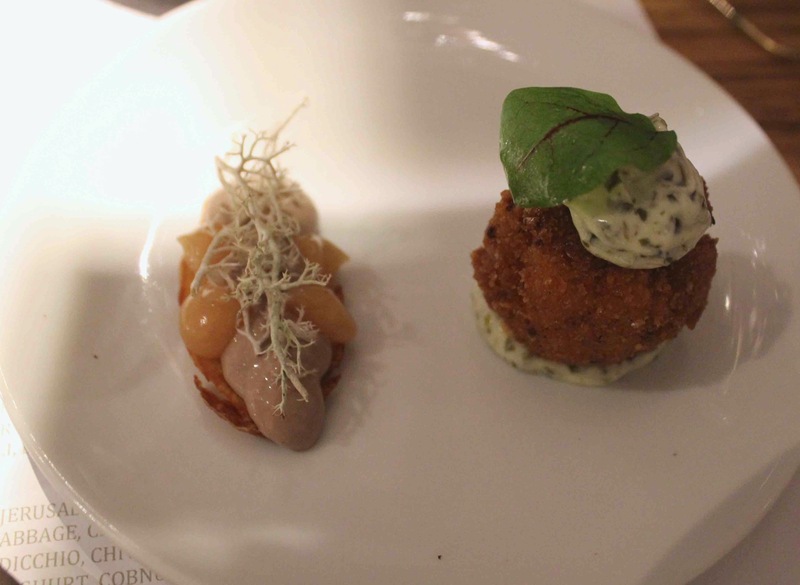 I really was gunning for the jersualem artichoke ice cream with chocolate crumb and wood sorrel. Alas, they had run out. So, I went with the maple syrup pudding, preserved plum, rum and buttermilk. For me, the maple sponge was a little on the dry side. 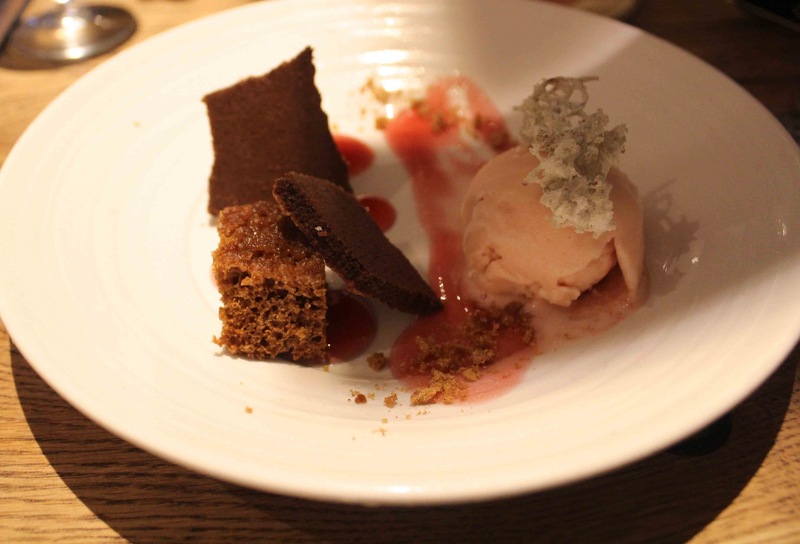 The crunch was absolutely scrummy though (it tasted a little like frozen candy floss) and the sorbet was rather good too; couldn’t really taste the rum though which was a shame. It seems a bit nuts that they didn’t have any hot puddings on offer. Puds as opposed to desserts really conjure up warming sweet dishes with lashings and lashings of custard in my mind. It would be amazing if they could integrate a little heat into the pudding section – I think it would really bolster the menu from good to v.good. Overall, each dish I had was nicely flavoured and cooked well. My main gripe though was the temperature of the savoury dishes which were all a bit tepid. Granted I spent a few seconds snapping pictures of the food but not long enough for the dish to be as lukewarm as it was. Having said this, I do like my food like I like my showers – hot (though not scorching). The service was bag on. Really chilled but professional and attentive. Whenever I was in need of a wine refill, extra bread and the like, there was always someone on hand to help. 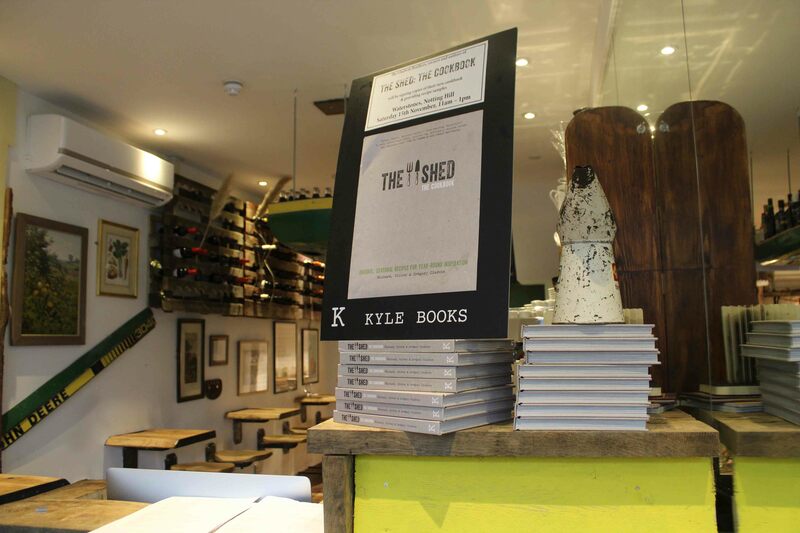 Also, the staff are knowledgable about the food but don’t reel of the menu in an annoyingly smug way. 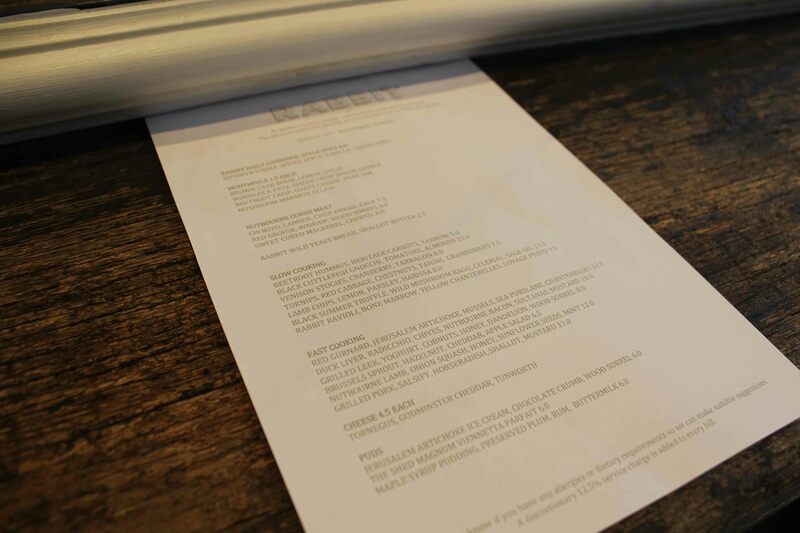 In fact, they really only go into depth about the menu at your request, so it’s a two way engaging conversation. The only thing that did annoy me a little was the over eagerness to clear away your plate. On numerous occasions we had to pin the plate to the table as we weren’t quite done soaking up every last bit of juice. However, if you’re not a glutton, you should be fine. I went back the following week to take pictures of the place and feeling rather peckish, I decided to have a small plate. Having eyed up the gnocchi last time I was here, it was the obvious choice (£10). The ink from the cuttlefish was used to die the gnocchi black; the cuttlefish itself was breaded and deep fried. I really enjoyed this dish: the gnocchi was soft and not too dense and I loved it paired with the slightly rougher texture of the deep fried cuttlefish which was sublime when dunked into nodules of the chervil cream dotted around the plate; also loved the sweet tomato sauce which was enriched with almonds, that sat underneath it. To be honest. I thought it was very decently priced. 3 main albeit medium sized plates, 2 ‘mouthful’ dishes and 2 puds, shared between two people left me full and over satisfied. I had two glasses of wine, so I paid a bit more (£45). The total bill came to £74. The gnoochi I had on a separate occasion was a tenner. Deffo good vibes in this resto. We were sat in a part of the restaurant that comprised small tables of two with suspended stools. From a quick whizz around, it didn’t feel like you were in ville de ponce – really just a mixed bag of people, in laid back attire, wanting to enjoy the new spoils being brought to the table from the Gladwin brothers. It had a very relaxed, unstuffy, friendly ambience. You’re into interesting British grub, cooked well and you don’t mind sharing your plate.